Connected by the Greenway Trail system, the 36,000 residents of Northglenn have great access to recreation, shops, and top notch dining. With quick access to Downtown Denver and DIA, Northglenn is a hotspot for working professionals and growing families. McAdams Plumbing is your best choice for plumbing repair in Northglenn. Let’s take a look at some of the services we can provide. We can take care of it. We’ll have your sewer and drain lines not only cleared, but cleaned thoroughly as soon as possible. We can’t list everything, so if you need help with something not shown here, give us a call. If for some reason we can’t help you, we’ll do our best to get you to a good company that can. An unattended leak can cause a great amount of damage in a very small amount of time. It is very important that if you have a leak, you hire a company that tracks that leak down to its very source and solves the issue there. At McAdams Plumbing we promise to not quit until we have found the source of your leak and fix it properly. In order to protect your home from water damage, we recommend the installation of a WaterCop Automatic Water Shut-Off Valve. A WaterCop is installed on your main incoming waterline and receives a wireless signal from sensors place around your home when they come in contact with water. This signal activates the WaterCop which shuts down incoming water. This could save you a great deal in water damage repair fees. 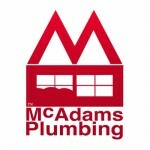 Thanks for taking the time to look at McAdams Plumbing. If you have any questions at all, please don’t hesitate to call; 303-465-1900.